UCF is off to its best start in school history, standing at 6-0 overall and 4-0 in AAC play. For their efforts, the Knights are up to No. 18 in the AP poll. They are coming off a tight 31-21 win at Navy, but will now shift focus to Saturday’s home game against Austin Peay (5-3, 4-1 Ohio Valley). Freshman Firepower: Two newcomers came up with some of the biggest moments in Saturday’s 10-point road win over Navy. First, it was redshirt freshman Brandon Moore. Just when it looked like the Midshipmen were driving to potentially take the lead, Moore came up with a big hit that forced a fumble that he then recovered. The turnover changed everything, as it got momentum back on the Knights’ side with little time left. Once UCF got the ball back, freshman Otis Anderson helped the offense down the field. He capped off the drive with a game-sealing touchdown. On the drive, he rushed for 41 yards and caught a six-yard pass on a crucial third down. After Anderson’s touchdown extended the Knights’ lead to 31-21, Moore came up with an interception to end any Navy comeback hopes. Linebackers Leading the Way: When the Knights lost their entire starting secondary after last season, there was pressure on the front seven to step up this year. Through the first six games, they definitely have. A lot of that has come from an experienced group of linebackers. “Everyone just bought in to what Coach Frost is bringing to the program, what offensive and defensive coordinators are giving us as a game plan,” redshirt senior Chequan Burkett said. 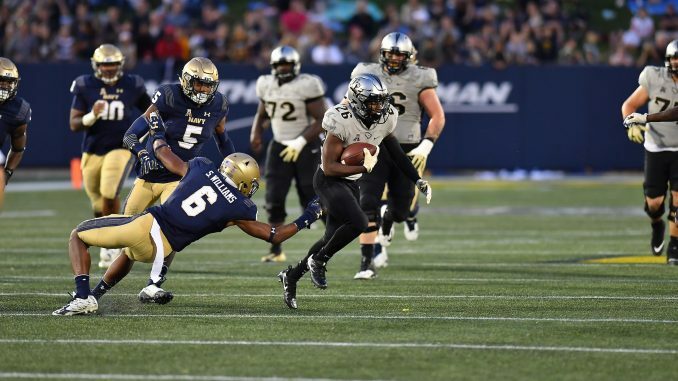 Facing Navy’s potent option offense, UCF’s linebackers came through in a big way. Burkett finished the day with 13 tackles, playing a huge part in stopping the run. Redshirt senior Shaquem Griffin finished with 10, but it was junior Pat Jasinski that led the way with a career-high 14 tackles. Killins Continues to Emerge: There were flashes of big-play ability from Adrian Killins in his 2016 freshman season, but he is emerging as an even bigger threat this season. He had another solid day on Saturday, rushing for 122 yards and two touchdowns. The speedy sophomore took off for a 79-yard touchdown run in the third quarter. However, his 15-yard touchdown run earlier in the day showed more physicality than speed. Killins now has 413 yards and five touchdowns on the season, averaging an efficient 8.4 yards per carry. Focusing on the Foe: Throughout the season, Frost has delivered a consistent message to his team, preaching that there is nothing to be gained from looking ahead. The players are buying into the message, staying focused on the very next opponent. The Knights, riding high after prevailing in their first close game of the year, now return home for a different type of matchup. Austin Peay just broke a 29-game losing streak earlier this year. As an FCS team, the Governors are easy to overlook. But this is a team with nothing to lose, and they will surely play that way on Saturday.